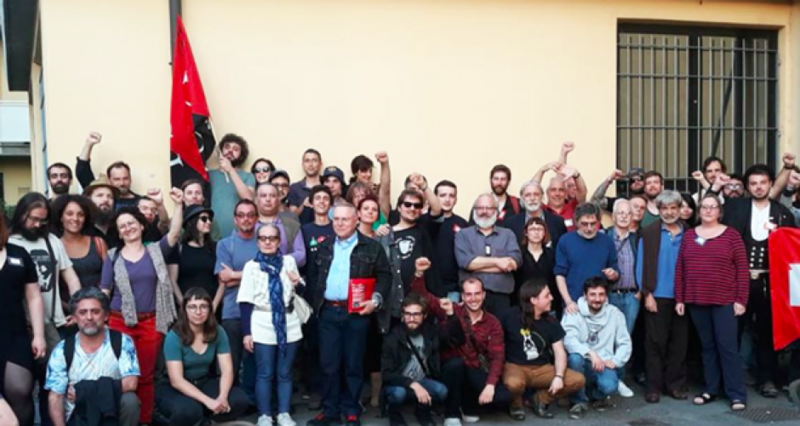 “Delegates and observers from Greece, Brazil, Morocco, Bulgaria, Netherlands, Belgium, Germany, Italy, Catalonia, Spain, Poland, United States, Canada, France, Austria and Argentina sent solidarity messages or attended the Congress, which was organised at the headquarters of the Italian independent USI union. United Voices of the World organiser Claudia Turbet-Delof concluded that the congress had been ‘an enriching experience, especially for me as a feminist, migrant trade unionist, and has stirred profound reflection on what union organising means to me and what we, as workers, hope to achieve.' "
Does the new confederation have a website, any official points of contact, anything like that? I've not seen anything like that. Hopefully there will be more information soon. It's not very clear in the article above, but there's an interesting short film talking to some of the delegates (from CNT-F, IWW (US) and UVW) when you follow the link. It is certainly curious that people from Brazil attended when there isn't any real militant organization in the country that builds this kind of iniitative in workplaces - if there are, I'd like to get in touch hehe. The video is better because it shows some of the real movements building some sort of solidarity across borders and sharing knowledge. They had 4 people there (one of the biggest delegations) and it seemed pretty clear that there was a real organization behind them.